1. Freddie Freeman – Bats: L Throws: R – 6’5″ 220 – ATL – 9.12.89. I don’t think I’ve ever truly understood how good Freddie Freeman has actually been. Maybe it’s the fact that he was a second round pick of the same Braves draft class that produced Jason Heyward that I viewed Freeman as somewhat of an afterthought. While I still don’t think he’s as good as Heyward, very few humans are, so I shouldn’t hold him responsible. Freeman has been one of the youngest players at each level he’s played at as a professional and has still produced each step of the way. When a 20 year old posts an .898 OPS in AAA I guess it gets my attention. Congrats kid, you’re my number #1 first baseman. Your parents must be proud. 2. Eric Hosmer – Bats: L Throws: L – 6’4″ 215 – KC – 10.24.89. Hosmer was the #2 ranked prospect in the Texas League behind only his Northwest Arkansas teammate Mike Moustakas. Following a horrible 2009 season Hosmer was ranked #7 on this list last year, and treated himself to off-season laser eye surgery. The results have been nothing short of spectacular as Hosmer had a near 1.00 BB/K% and posted a .977 OPS. 3. Brandon Belt – Bats: L Throws: L – 6’5″ 195 – SF – 4.20.88. As a college baseball fan, I’m partial to professional guys that I was able to follow in their college years, and while Belt was a good college player he wasn’t supposed to be this good as a professional. The 5th round pick out of Texas wasn’t even included in the top 30 Giants prospects prior to the 2010 season by Baseball America. Belt got off to a great start in the hitters heaven that is the California League but he produced at all three levels last season, finishing with a 13 game stay the AAA Pacific Coast League. On top of the 40+ doubles, 10 triples, 23 HR, 22 steals, 1.00 BB/K ratio and 1.075 OPS, he’s an excellent defensive first baseman. There’s a lot to love about that last sentence if you’re into metrics and commas. 4. Jonathan Singleton – Bats: L Throws: L – 6’2″ 215 – PHI – 9.18.91. First he writes and directs a great film like Boyz N the Hood then he takes up baseball and becomes a promising prospect. OK different John Singleton. Regarded as the top prospect in the South Atlantic League, Singleton possesses power and patience at the plate reminiscent of Ryan Howard. With Howard in front of him, Singleton has experimented in LF but with his anticipated MLB debut being years away, it’s too early to be talking about a position change. 5. Yonder Alonso – Bats: L Throws: R – 6’2″ 210 – CIN – 4.8.87. Like Singleton, Yonder is blocked by an All-Star in Joey Votto but it’s much closer to decision time for the Reds with regard to the Cuban born Alonso. 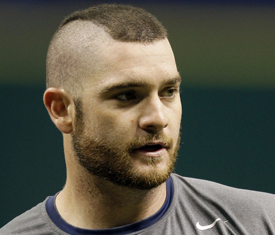 Yonder did play 30 games in LF last season and he can’t be much worse defensively than Johnny Gomes but it’s unclear that he can match Gomes in the ever so crucial mohawk category. Another go at AAA wouldn’t be the worst thing in the world for Alonso as his pitch recognition was exposed in a late season call up. 6. Chris Carter – Bats: R Throws: R – 6’5″ 230 – OAK – 12.18.86. Look out Crash Davis, Carter has 149 career minor league HR, but he won’t get enough minor league time to accumulate the 100 or so needed to break Crash’s fictional record. A first basemen by trade, Carter didn’t play a single game at the position upon his August 9th promotion to Oakland as all 22 of his MLB appearances came at either LF or DH. You know what you’re going to get with Carter; a lot of HR’s and a lot of K’s but he does take his fair share of walks (13.2 BB% last season). If he can win a spot in Oakland this year he could produce enough power numbers to be an All Rookie Team selection. 7. Jerry Sands – Bats: R Throws R – 6’4″ 225 – LAD – 9.28.87. Sands was so impressive in A ball I had to do a double take to verify that he was doing it in the frigid Midwest League and not the California League. Sands, the NCAA DII product, has a power/athleticism combo that is rare for a 1B. He’s spent significant time at all 3 OF positions over the past 2 years and even played a game at 3B last season. Frankly it doesn’t matter where he plays as long as he’s posting a .981 OPS. ll likey start the season in AAA Portland. 9. Lars Anderson – Bats: L Throws L – 6’4″ 215 – BOS – 9.25.87. Lars may have been the top first base prospect in baseball entering the 2009 season and that’s probably the primary reason why he’s still hanging around my top 10. With Rizzo out of town, Lars has reasserted himself as the first baseman of the future in Boston. After an awful 2009 he had a less awful 2010 and made his MLB debut at age 22 so that’s something. 10. Paul Goldschmidt – 1B – ARI. Bats: R Throws R – 6’4″ 220 – ARI – 9.10.87. A high school teammate of Blue Jays pitching prospect Kyle Drabek, Goldschmidt put up such spectacular numbers in the California League that it’s tough for me to ignore. Because of the historical statistical inflation of said league, Goldschmidt’s very appearance on this list could be really be interchanged with other first basemen of the notorious hitter’s league such as Seattle’s Rich Poythress or Washington’s Tyler Moore but suppose I think Goldschmidt’s numbers are slightly less inflated than the other guys.